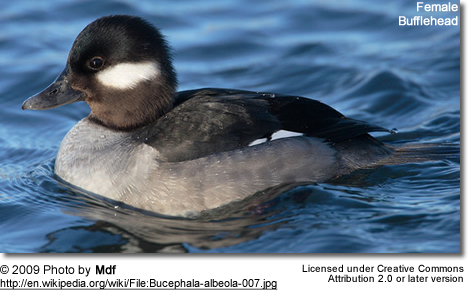 The Bufflehead (Bucephala albeola) is a small sea duck of the genus Bucephala, the goldeneyes. This species was first described by Linnaeus in his Systema naturae in 1758 as Anas albeola. 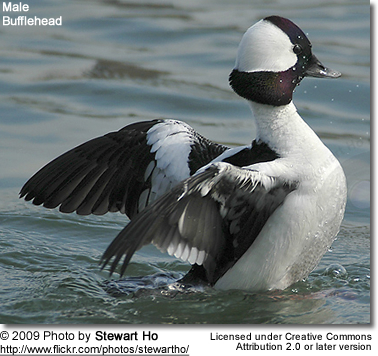 Buffleheads do not tend to collect in huge flocks; groups are usually limited to small numbers (less than 10). One duck will serve as a sentry, watching for predators as the others in the group dive in search of food. Predators of adults include Peregrine Falcon (Falco peregrinus), Snowy Owl (Bubo scandiacus), Bald Eagle (Haliaeetus leucocephalus), Great Horned Owl (Bubo virginianus) and Cooper's Hawk (Accipiter cooperii). Females may be killed on the nest by mammals, such as weasels (Mustela spp.) or mink (Mustela vison), and by Goldeneyes over nest competition. 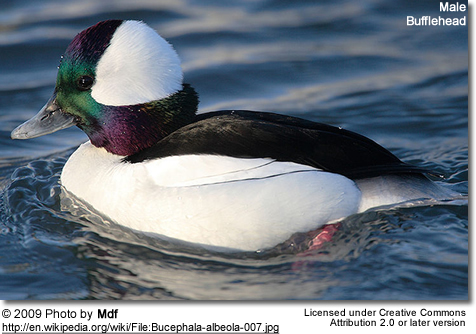 The Bufflehead ranges from 32-40 cm long (12.5-16 inches) and 270-550 g (.6-1.2 lbs), with the drakes larger than the females. Averaging 35.5 cm (14 in) and 370 g (13 oz), it rivals the Green-winged Teal as the smallest American duck. 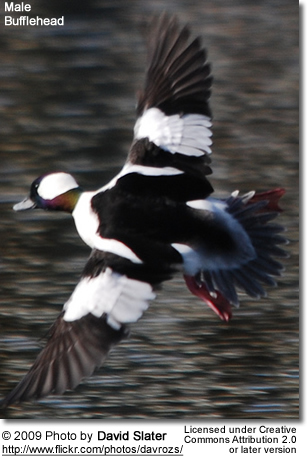 Adult males have a glossy, greenish-black head with a large white cap behind the eye and a mainly white body with a black back. Adult females have a brown head with a smaller white patch behind the eye and a mainly brown body with a light underside. 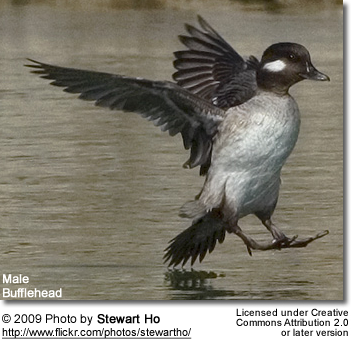 Their breeding habitat is wooded lakes and ponds in Alaska and Canada. They nest in cavities in trees, often using old Flicker nests. They nest in cavities in trees, often using old Flicker or Pileated Woodpecker nests, occasionally 425 m (1400 ft) from water. Nest competitors include Mountain Bluebird (Sialia currucoides), Tree Swallow (Tachycineta bicolor), Northern Flicker, and European Starling. 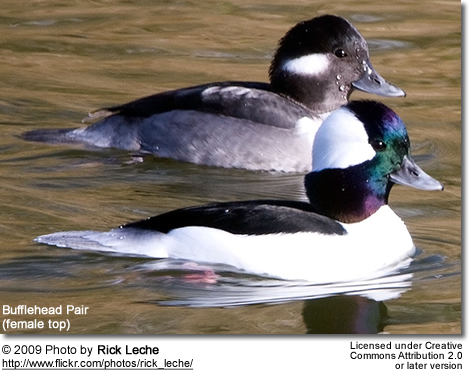 There was one recorded instance of a female Barrow's Goldeneye killing a Bufflehead adult female and her brood. 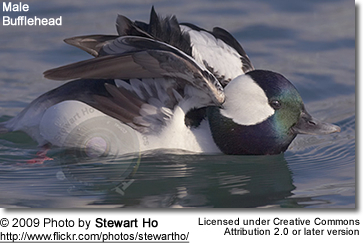 Smaller cavities are preferred because of less competition with the larger Goldeneyes. A clutch may range from 5 to 10 eggs. Eggs are typically about 36.3 mm (1.4 in) in breadth and 50.6 mm (2 in) in length, weighing about 37.4 g (1.3 oz) on average. The incubation period ranges from 28 to 33 days, during which the female is quite attentive. Locally, the clutch survival rate may range from 45% to 5% based on factors like cold weather, rain, competitors (i.e. grebes or other ducks) or predators (like Northern Pike). The female abandons the nest after 5 to 6 weeks, and the young fledge at 45 to 55 days of age. These diving birds forage underwater. They prefer water depths of 1.2-4.5 m (4 to 15 ft). In freshwater habitats they eat primarily insects, and in saltwater they feed predominantly on crustaceans and mollusks. Aquatic plants and fish eggs can often become locally important food items as well. Habitat degradation is now the major threat to this bird, since they almost always return to their hatch site to breed. 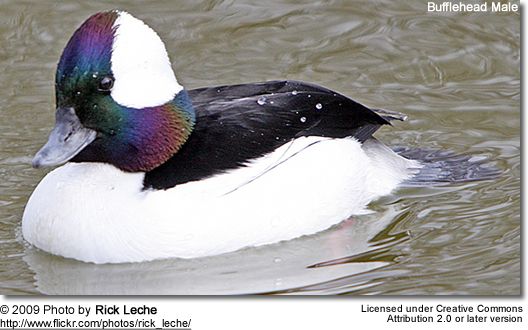 Although Buffleheads do use man-made nest boxes, they still need the forest habitat in order to thrive.